DOST Admissions 2018, Degree Online Services, Telangana (DOST) is a friendly and effortless way to apply for undergraduate courses, such as B.A., B.Com., B.Sc., B.B.A., B.C.A. etc., offered by various colleges in Telangana State for the academic year 2018-19. Online Degree Admissions Committee has decided to give a notification on May 8 for Online Degree Admissions for 2018-2019 and a Tentative schedule has been prepared for this admissions. Online Degree Admissions schedule to be announced on May 8 and online applications along with web options will be received from the eligible candidates from May 10 to May 26. First phase seats allotment should be announced on June 04.CCE and SPD Telangana has constituted the Project Monitoring Unit (PMU), Core Committees, Centre for Good Governance (CGG) and Help Line Centres for DOST Online Degree Admissions. 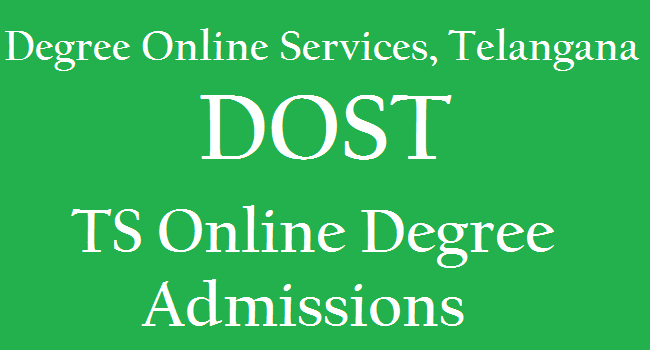 Online Application Form of Degree Online Services, Telangana is given below for admissions into various undergraduate courses, such as B.A., B.Com., B.Sc., B.B.A., B.C.A. etc., offered by various colleges in Telangana state for the academic year 2017-18. Candidates are advised to fill the online application on or before the last date. #You will find the home page with the six university logos and various instructions, information of Colleges, Courses etc. #Thoroughly read all the instructions on the home page such as Check List, Student Instructions and browse the Colleges and Course list . #Click on "Register" button for registration process. #UG Online Admission Payment Form will appear. Please fill in the Student Details in the form. #After filling the UG Online Admission Payment Form click on Proceed to Payment button. #Payment gateway page will appear. Pay your online application fee using your Credit Card / Debit Card / Net Banking facility. #If payment is successful you will see a message which looks like below.
" Your payment was Successfull for Rs.100/- on DD/MM/2018...Your Transaction Id is XXXXXXXXXX and Acknowledgment no. for your Application is: XXXXXXXXXXXX"
#Please write down your application number. Also you will receive SMS with your application no. to your registered mobile no. #Click on the application button next to home,the UG Online Admission Form FOR ACADEMIC YEAR : 2018-19 will appear. #For students of Board of Intermediate Education, Telangana , some of your information will be auto filled by the software and you complete the remaining information. #For students who belong to the boards other than Board of Intermediate Education, Telangana all the details must be entered by the student. #Please enter equivalent percentage of CGPA accurately. #After furnishing all the details, click on the Preview button. #Verify your Details once again and Press "SUBMIT" button to submit UG Online Admission Form. #DOST Online Admission Registration Payments Status and Web Options page will appear. #To Excerise Web Options click on "Click for Web Options" link. To Exit click on LOGOUT. #You need to fill in the "Student Details Form" only once. #You have to pay Rs.100 for seeking admission for all the six universities. #You may apply for unlimited number of colleges within a university. #You may apply for more than one combination within the permitted undergraduate programme. #You may apply for one or more or all the six universities. Registration is required to be done only once. #All the students, who applied under special category ie., NCC, NSS, Sports, CAP should get their certificates verified at helpline centres of the respective Universities. Dates will be informed in advance for each special category. Officers of concerned departments will be available for verification of the special category certificates. #Candidates seeking admission to Ist year B.A./B.Sc./B.Com. (Gen/ Computers/ Comp.Appln. )/ B.Com. (Voc)/ BSW/ BBA/ BBM/ BCA Degree courses must have passed Two year Intermediate Examination conducted by the Board of Intermediate Education, Telangana State OR an Examination of any other University/Board recognized as equivalent thereto (other than Pre-Degree course in Oriental Languages of OU). #In respect of the candidates, who have passed Intermediate(Vocational) courses from Board of Intermediate Education, Telangana State and +2 examination conducted by Boards other than Board of Intermediate Education of Telangana State ICSE and CBSE, the Principals of respective colleges should ensure that the candidates shall submit Eligibility Certificate issued by Board of Intermediate, Telangana State Further, the admissions made without obtaining Eligibility Certificate will not be considered by the University and such admissions shall deemed to be cancelled automatically and the College Management will be held responsible for such violation. #The Candidates who have passed Intermediate (Vocational) Medical Lab Technology Course from Board of Intermediate Education, Telangana State/ or from any other state equivalent to it are eligible for admission into B.A. /B.Com courses only. However, those who are holding ‘Bridge course’ along with Intermediate (Vocational) Medical Lab Technology are eligible for B.Sc. courses. More information for Eligibility Criteria Click Here. 1. Make as many web options as possible to secure your seat for each university. 2.Please note that the allotment will be made on the basis of options given by you depnding upon your merit eligibility (such as Marks, Category of reservations, age in case of a tie). 7. The servers will be closed for web options on 6th June 2018 by 12.00pm. 9.Your seat allotment will be intimated to you through SMS to your registered mobile number. You can log in to your dost account and take a print out of your allotment. 1.You can confirm your admission by visiting the concerned degree college and the college will verify your certificates.You have to pay your college admission fees. The principal of the college will confirm your admission by issuing a printed slip. 3. Report to the college by 20th June 2018 for confirming your admission.